Breakfast this morning was a homemade whole wheat bagel with cream cheese for JR and two chocolate chip muffins for Zuzu. (Me? Why, I had a lemon buttermilk doughnut, thank you very much.) I packed Zuzu’s lunch box with three homemade Filipino egg rolls — also known as lumpia — and some spinach orzo salad with feta and pine nuts. This kind of weekday feasting can only mean one thing: it’s the day after the Chicago Food Swap. This past Sunday was the April Chicago Food Swap held at Local Goods Chicago, a charming and eclectic boutique featuring clothes, jewelry, crafts and foods by Chicago-area artisans. Although the space was tight, our gracious host made room for us by re-arranging her store, and we appreciate all her hard work. I know many of our swappers were entranced by Local Goods Chicago’s wares, especially the Chicago-themed ones. If you are looking for a unique birthday, baby, wedding or house gift, you should definitely stop by Local Goods Chicago. Zuzu picked up a ring and headband for herself and I bought a beautiful hand-crocheted blanket for a friend’s new baby. But, back to the food. 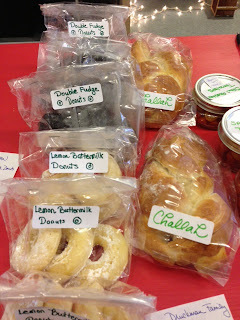 As always, the swap offerings were diverse, creative and delicious. On the savory side, there were several varieties of bagels and crackers from first-time swapper Katherine; pepperoni rolls made by Todd; Filipino eggrolls from Pamela — who scored a huge hit in February with her empanadas — Bolognese sauce from veteran swapper Serena; spinach-orzo salad from Michelle; and some dips and spreads, including spinach pesto, my own pumpkin seed pesto, vegan garden pâté and hummus. It’s always interesting how swap items come in waves. At the February swap there were at least three different kinds of hummus on offer; this time, I was the only one who brought hummus. 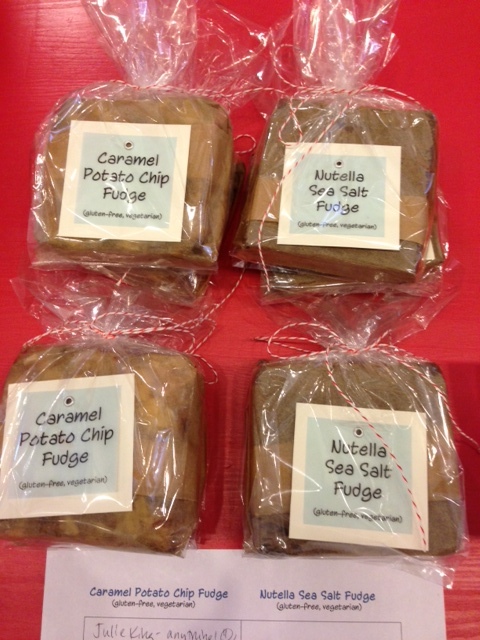 Naturally, there were also many decadent sweets. We had two different kinds of fudge; delicate citrus-scented palmiers from Jules and chocolate chip muffins from her sister Melisa; Mexican chocolate pound cake from Nancy — which I really meant to get, darn it! — stunning chocolate espresso tarts from new swapper Sandy; two different varieties of doughnuts from Chef Druck and family; salted caramel sauce; Julie’s tiger butter bark, which looked as good as it tasted; and professional-looking carrot cake cupcakes — those I did get, yum! As always, we had plenty of food in jars. 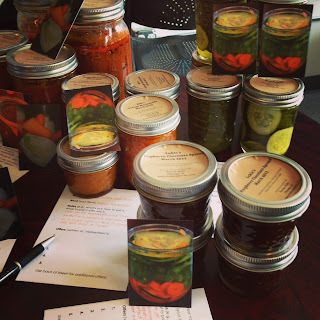 Pauline brought her global cuisine-inspired hot sauces, like Peri-Peri and Indian green chutney; Erielle made grapefruit-ginger curd; and I saw jams, marmalade and pickled vegetables of all kinds. Something new this time: swappers Melisa and Jules, who aren’t canners themselves, brought back empty jars from previous swaps for people to take home and re-use. What a terrific and eco-friendly idea! Drink syrups are always popular swap items and we had a few goods ones. In addition to my sour cherry syrup, we had date cola and coffee syrup from Nancy and ginger brandy from Meg, which smells divine. I was lucky enough to score a bottle. I am always intrigued by swap items that aren’t to eat right away but rather are designed to help you cook better in the coming weeks. Among the pantry items that I saw were flavored salts including lemon rosemary and Sriracha from swapper Katje. Pauline, who as we know loves all things spicy, was so inspired that she went home and made hot sauce-infused salt that same night. That is the beauty of the Chicago Food Swap in a nutshell. Not only do you come home with loads of delectable goodies, you also come home with new ideas of things to try in your own kitchen. 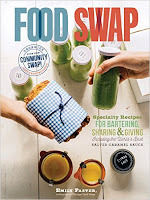 The May 12 Chicago Food Swap at The Scrumptious Pantry is now completely full. If you still would like to join us at that event, please put your name on the wait list. We always end up opening some spots. Also, stay tuned for updates about future events, including, we hope, our biggest swap yet! This looks amazing! I need to think of something epically creative to whip up before I venture in for a swap. Kelly, the offerings range from the esoteric to pretty standard salsa and cookies. It doesn't have to be fancy - just homemade and yummy!